Constructed of 90% Wool / 10% Blended Fibers. Woven. Dry clean only. Very warm and comfortable blanket. Can be used for both indoor and outdoor use. Wool has low rate of flame spread, low heat release, and low heat of combustion. Wool is static resistant as the retention of moisture within the fabric prevents a build up of static electricity. Fire retardant. Dimensions: 62" x 80" (Inches). 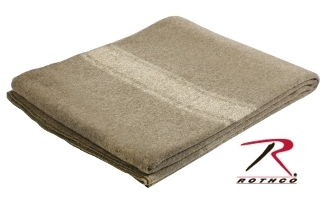 Brown European Style Wool Blanket.